India’s vehicle inspection programme, the Pollution Under Control (PUC) certificate represents the early stages of inspection and maintenance (IM), which took roots in the US during the 1970s and subsequently in Europe. In India, the first phase of the programme (1991-2004) included the simplest test of carbon monoxide (CO) concentrations in the exhaust of petrol vehicles at low-idle speed, and the opacity of the smoke from diesel vehicles during free acceleration. Since October 2004—nearly 13 years after the inception of the programme—an additional Hydro Carbon (HC) test has been introduced in petrol vehicles. Small shops in refuelling stations, one or two operators manning a gas analyser and a smoke metre are the typical archetype of the vehicle IM systems in all Indian cities. Section 56 of the Motor Vehicles Act, 1988 governs the fitness check for commercial vehicles. Rule 116 of the Central Motor Vehicles Rules, 1989 (CMVR) deals with the emissions inspection for vehicles. Commercial vehicles have to undergo mandatory annual roadworthiness test and obtain a certificate of fitness. They additionally require emissions tests every three months in Delhi and every six months in other states under PUC. Private vehicles, on the other hand, do not require mandatory fitness and safety checks till they are 15 years old. But they do require PUC tests as frequently as the commercial vehicles. Commercial vehicles require PUC certificate in six months, not as often as private vehicles. On January 17, 2017 and February 6, 2017, the Supreme Court directed the Environment Pollution (Prevention and Control) Authority (EPCA) for Delhi, National Capital Region (NCR) to inspect PUC centres in the National Capital Territories of Delhi and also those in the districts of NCR. In response, the Centre for Science and Environment (CSE) for EPCA carried out a physical inspection of PUC centres to chart a roadmap to improve the programme. Although the PUC network is online and linked to a centralised server in Delhi, the data recorded at the PUC centres is poorly collected, collated and analysed at the level of the central server, found the review. In spite of having uniform software to record the data, the back-end database maintenance is abysmal, and does not record important fields, such as year of manufacture/registration, vehicle type, or fuel type. The assessment shows that there are serious quality concerns in the way PUC tests are conducted and equipment maintained in centres across NCR. There are many small and decentralised centres with weak regulatory oversight. The physical inspection and monitoring protocol is grossly insufficient. 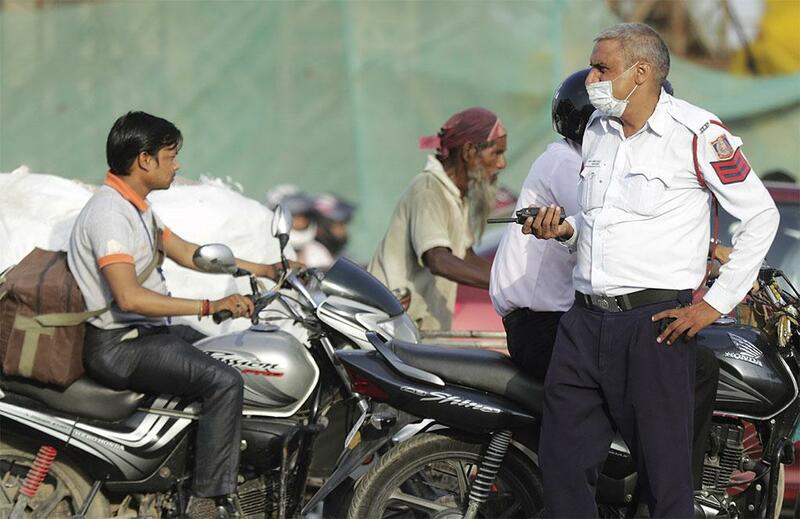 Delhi has 28 Department of Transport inspectors, of which just one is dedicated for inspection. In NCR towns, the number of inspectors varies from two to nine, whereas the number of PUC centres range from 10 to more than 100 in just one town. The rampant cheating and malpractices, which includes fake software, false passes and inappropriate tests were reported by CSE’S inspection teams. In fact, out of the total 1.37 million cars tested Delhi, nearly 20 per cent of tests recorded zero values, which is not possible since even the new technology vehicles registered minimal carbon monoxide (CO) and HC values. But sensitivity of instrument—the lowest value it can record should be verified whenever a PUC centre repeatedly reports zero values. Manual recording and non-uniformity in the format of PUC data makes data retrieval and analysis difficult. The data is online and automatically linked with the central server with uniform standardised software only in Delhi. This has helped in minimising the manual interference with test results. But even with the online system, procuring the data in a standardised format has been challenging in Delhi, making assessing compliance level difficult. It has not been easy to get disaggregated data by vehicle types, fuel types, or by manufacturing date. Initially the data was garbled and unreadable. It may be noted that despite huge investments in the online and automatic system in Delhi, its accessibility and usability for monitoring has remained poor. This requires immediate attention. Cities with manual monitoring systems have no centralised database to allow regular analysis to inform the system. The CSE analysis shows that the transport departments in NCR do not have clear information on how many vehicles turn up for tests. An indicative assessment for this report based on the data on total number of tests carried out in one quarter of a year in Delhi shows only 23 per cent of vehicles turned up for tests, or 1.37 million tests per quarter against an expected figure of 5.91 million tests. This needs strong tracking as well as a solution to ensure 100 per cent compliance. The analysis shows that nearly all vehicle pass. While evaluating the programme, CSE had analysed the PUC test results for different categories of vehicles in Delhi and NCR, submitted by the transport departments in NCR. One critical observation was the very poor failure rate of vehicles at the PUC centres. On an average, not more than 1.68 per cent of diesel vehicles tested and 4.5 per cent of the petrol vehicles tested. In Delhi, only 1.68 per cent of diesel vehicles failed the smoke density tests and about 4.5 per cent of the petrol vehicles failed the CO and HC tests. There was a very wide margin of difference between the test results and the limit values for a majority of vehicles. Poor failure rate is not only a reflection of poorly conducted tests and poor data but also a reflection of lax PUC norms, which rarely fail the vehicles. Not only most vehicles pass the test but many pass the test with as high as 80 per cent margin from the norm. This calls for immediate tightening of the norms, particularly for the pre BS-IV vehicles. Comparatively, the tests prescribed for petrol vehicles are more evolved and complex. Petrol vehicles are tested for CO, HC and lambda, which is air to fuel ratio, as against tests for diesel vehicles, which only involves a smoke opacity test. For CO emissions, almost 70 per cent of the total petrol vehicles tested clear the most stringent PUC norm currently. For HC emissions, almost 88 per cent of petrol vehicles meet the BS IV standards. The rapid survey has shown ill-maintained equipment, lack of documentation on calibration of equipment, poorly done tests, lack of standardised software in testing equipment in NCR. Besides, wide malpractice and fake certificates compromise the effectiveness of the programme. CSE’s investigation found that emissions testing probes are not even inserted in the exhaust pipe, or it remains unconnected with the computers at the time of testing to show false passes. For quality control, the PUC centres are required to display type approval certificate for equipment, operator training certificate, and calibration report. Some of the centres inspected were found defaulting on these grounds. Depending on the irregularities, departments are either expected to issue warning, or show cause notice or cancel license. But effective implementation of these requirements is not uniform across NCR. The region requires a standardised protocol to monitor and manage PUC centres. Limit the numbers of PUC centres, upgrade them and bring them under strong supervision and quality control. Ensure 100 per cent compliance by linking annual vehicle insurance with PUC certificates. Introduce automatic online network for transmission of PUC data to the central server to minimise manual interference and allow proper analysis of data for remote auditing of PUC centres. Mandate payment of PUC fees before tests are conducted. Strengthen inspection and licensing programme of the PUC centres. Integration of On Board Diagnostic (OBD) systems with the PUC programme. Tighten the limit value for pre-BS-IV vehicles. Strategy for advanced Real World Driving Emissions (RDE) monitoring of new generation vehicles to come with BS VI emissions standards in 2020. SC’s order forced the government to take responsibility for the failure of the PUC regime in identifying gross polluters. The latter now has the monumental task of overhauling the vehicle emissions monitoring system for the pre BS IV vehicles and the future implementation of BS VI emission standards. This requires stringent management of pollution checking centers, adapting new testing methodologies, procedures; especially laying the roadmap for the Bharat Stage VI emission standards. First and foremost, the government needs to have a cohesive monitoring process which combines PUC with Real Driving Emissions Tests, and OBD systems. This should be further supported by tightened emission standards for Pre-BS IV vehicles. The government must prioritise corrective measures in the most basic stages of the current monitoring system. Efficiency of data collection, data integrity and veracity of PUC test has to be ensured. Having a centralised online system is the most optimal way. It is clear that a large numbers of decentralised PUC centres across NCR need a re-think. To make this system work, city governments require exceptional administrative capacity for enforcement. This is seriously compromising the effectiveness of the programme. Merely allowing further expansion of and investment in the current PUC centres will only create entrenched business interest in a weak programme. Therefore, a strategic phase-in plan for centralised emissions testing centres that are fully automatic, can eliminate manual interference, and are capable of conducting high volume of emissions tests should be implemented for commercial vehicles first. This will also help to upgrade the emissions testing system and procedures that is not possible in small centres. Such systems can be first phased in for the commercial vehicles in the NCR and subsequently extended to other priority vehicle segment. Certain states have already upgraded their ground PUC by linking them on an online platform, regulated by the State Transport Department. The Supreme Court order has now mandated the same to be done in NCR cities. CSE had found that many pollution checking centers across Delhi NCR had a disproportionate number of vehicles actually being checked or penalised for polluting above the permitted levels. Issue of corruption and malpractice is endemic to the entire PUCC system across Delhi NCR cities, except Faridabad, which had the best enforcement figures through administrative interventions. The state governments have to approach the issue of high volume of PUCCS from the point of ensuring high quality operation and must rationalise the licensing policy for PUC centers. OBD II is designed to inform the car-owner about any malfunction, including any problems with brake or emissions control system. At present, the indicative Malfunction light (MIL) is used as the prompt to check vehicles internal emission control systems. The Ministry of Road Transport and Highways (MORTH) has already directed transport departments to ensure centres must check if MIL is ON (red), then the vehicle should be sent back to the manufacturer for detailed check and repair. The present PUC test procedure, as per Rule 115 of the CMVR, 1989 specifies verification of a MIL of OBD before carrying out PUC test. If MIL is ON i.e. there is engine / emission system fault, then the vehicle owner is required to get the vehicle serviced. A detailed analysis of the OBD fault will be carried out using scanning tool at the service centre. It was submitted in the court that hand-held scanners are now available to carry this out. The use of scanners requires a process of graded utilisation and installation in different parts of the country, i.e Grade A, Grade B, Grade C and Grade D cities, in that order. MORTH should issue protocol for OBD fault analysis, and emissions norm compliance to integrate OBD checking with PUC programme for BS IV vehicles and onwards. However, just checking or not accepting a vehicle with MIL switched-on is not enough. Clear protocol is needed for a visual check of MIL and an electronic examination of the OBD computer. In short, the inspection centres require OBD scanner and protocol tests to pass and fail a vehicle. The OBD inspection equipment prints the test results and a receipt. If a vehicle fails the test, the result indicates the reason for the failure. It also provides information to an automotive technician who repairs the vehicle. The certificate show results of check engine light test, readiness monitor test, communication test and diagnostic trouble codes. Since 2010, all new BS IV compliant vehicles have come equipped with OBD that were further upgraded in 2013. The OBD system stores important information about any detected malfunction in vehicles, so that a repair technician can accurately find and fix the problem. This identifies emission-related components covered under warranty. Fault codes and other scan tool data gives information about the area of malfunction or a specific component. This helps with early detection of malfunctions. Globally, this tool is being integrated with vehicle inspection and maintenance programme. In addition to the physical check, the information can be scanned and acted upon. MORTH needs to develop a protocol to integrate OBD with vehicle inspection programme in state transport departments as priority. EPCA had advised MORTH to ensure a definite protocol to monitor vehicular emissions in real world conditions with portable devices for BS VI vehicles rolled out in 2020. Real driving emission measurements is a detailed and comprehensive emissions measurement process and is slated for implementation along with BS VI norms at the time of new model type approval. Further, verification of real driving performance of vehicles at the time of conformity of production test will be carried out. It is more important to re-emphasise that the Euro VI vehicles arriving in three years will have different in-use monitoring requirement. The Euro VI notification of the MORTH has provided for real-world driving emissions test procedures and standards – real emissions to be monitored while vehicles are moving on the road. This now requires a clear implementation strategy and systems as BS-VI vehicles will be registered and sold from April 2020. EPCA is stressing on this, particularly, as the country will make huge investments to improve fuel quality to meet BS VI emission standards. If randomised Real-World Driving tests are conducted on a regular basis, then it would ensure a vehicle’s internal emissions control systems are working optimally on road and its on-road emissions are under control. This is being recommended given the experience of European and other countries, which have found huge variations between the emissions at the time of type-approval and what is found in real world driving. This has become necessary in view of the rapid deterioration in emissions noted in new Euro VI vehicles in Europe and the US and also to prevent use of defeat devices to cheat emissions standards. Data from Europe shows that the actual Nitrogen Oxide (NOx) emissions from Euro VI diesel cars can be as bad or worse than a Euro I diesel car as on-road emissions can be up to 16 times higher than their certification level due to such cheat mechanisms. RDE testing will be included as an additional requirement for vehicle certification. Emissions measurements will be carried out with the help of Portable Emission Measurement System and onwards in-service conformity factor will be applied to ensure that emissions from vehicles remain within the stated margin. This can prevent emissions cheating and use of sub-standards emissions control or defeat devices as was done by Volkswagen. UK has reported of cases where motorists were caught driving illegally modified diesel cars without pollution filters. This has been possible because emissions tests do not always detect the alterations made the vehicle. Any assessment and overhaul of vehicle inspection programme at this juncture will remain incomplete and inconsequential if strategies to address the on-road emissions from new generation vehicles with advanced emissions control systems are not prepared and implemented now. Current basic PUC emissions tests will not be able to address these technologies advancement. Immediate steps will have to be taken to plan the system to enforce new rules for in-use emissions compliance, based on real driving emissions testing already notified by the MORTH. Interestingly, while conducting this rapid survey of the programme, the PUC operators pointed out that hybrid car models that are already come on road cannot be tested under the current PUC regime. But they turn up for tests as this is a legal requirement. This has been cited only to illustrate the point that new genre of technologies will require a different test regime.